Marcela De Vivo is a freelance writer for RedSeven and an avid traveler who has written about destinations all over the world. As a native of Colombia, she has traveled extensively all over South America. There’s nothing like a good day at the beach — except for an even better night of dancing and partying. With exceptional weather, picture-perfect beaches and a laid-back vibe, the islands of the Caribbean can help you exceed your vacation expectations day or night. If you’re in it for the party scene, you’d better do your homework. Some islands, like Bonaire, Martinique and Puerto Rico, are best known for their charm, cuisine or outdoor activities. But if you’re looking for the hottest party scenes and clubs, keep your eyes peeled for these fun generators when you’re booking next flight. 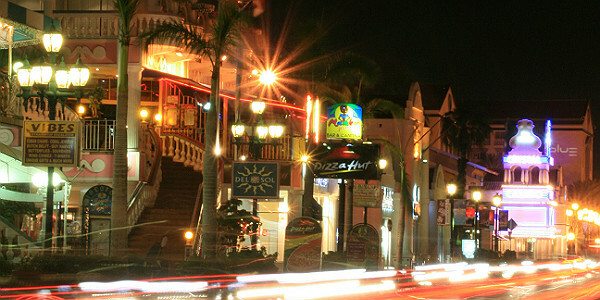 This is the place to be if your definition of fun is sleepless nights out, bar-hopping and music. Salsa’s on the menu at Club Hipsz, a trendy blend between New York and South Beach. Aside from dancing, you can even get dancing lessons from the actual owners of the place – salsa duo Reggie Bermudes and Sabine van Leuken – who can teach you a thing or two about merengue, bachata and, you guessed it, salsa. Beaming with over-the-top pageantry and good clean fun, the Aruba Carnival is the must-see event of the year. This one-month long festival is right up there with the famous carnivals of Rio de Janeiro and New Orleans. It will take you on a memorable journey of parades, lighting shows and powerful music. Often deemed the true Caribbean, Trinidad has celebration in its blood. This is a place where different cultures and ethnicities have come together to create a microcosm of dance, music and art as rich as its people. Emancipation Day, Arrival Day, Divaly and Hosay are just a few of the carnivals infused with artistic expression, energy and drama. In a crowd of thousands of people, even the most cynical traveler will have no choice but to start dancing to bass-heavy Soca music. The clubbing scene in Trinidad is lively and whimsical. You’ll go from doing Liquid Cocaine shots to dancing till five in the morning on sharp hip-hop, dancehall and reggae beats. Start at Nuvo Sera, for cocktails and don’t forget to include 51 Degrees Lounge on your nocturnal journey, if you’re into live music and happy crowds. For budget travelers, there’s always Jamaica; a vacation that is sure to hit the high notes, and a great place to end a Caribbean tour. Chilled out and laid back during the day, Jamaica explodes with energy and excitement when the moon rises. Get a good grip on a Red Stripe beer and adventure to Gloucester Avenue, the Jamaican mecca for all-nighters. If you’re feeling naughty, Hedonism II is true to its name in hosting the sexiest disco dance parties, such as Pajama Night and Toga Night. Make sure to follow in the footsteps of Uma Thurman, Busta Rhymes, Cindy Crawford and Tiger Woods and set foot in the legendary Margaritaville. Opened in 1996, this hot spot leads a double life: by day, Jamaican cuisine at its finest, at night, party starter and margarita expert. If you are looking for the ultimate party trip, try island-hopping to all these destinations to get the full Caribbean nightlife experience. Whether you are looking for a relaxing beach escape or a place to party the night away, look to the Caribbean to get the best of both worlds. To keep up with Marcela and her travels, you can find her on Google+ and Twitter. How To Get There: Aruba and Trinidad both have an international airport, while Jamaica has two, located in Montego Bay and Kingston. 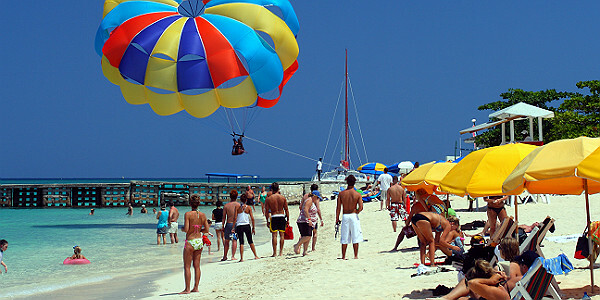 Aruba’s Queen Beatrix International Airport (AUA) is located about 5 miles from Oranjestad, the capital of Aruba. Over 25 airlines fly there including AirTran, JetBlue Airways & United Airlines.Piarco International Airport (POS) is about 15 miles east of Port-of-Spain, the capital of the Republic of Trinidad and Tobago. Over 10 airlines fly here, including American Airlines and United Airlines, with JetBlue Airways starting flights from New York City in February and Fort Lauderdale in May, 2014. Sangster International Airport (MBJ) in Montego Bay is one of the largest and busiest airports in the Caribbean. Located approximately five miles east of Montego Bay, it is served by over 30 airlines, including American Airlines, JetBlue Airways and United Airlines. The smaller of the two airports, Norman Manley International Airport (KIN) is served by 11 airlines including Air Canada, American Airlines, Delta Air Lines. It is about 10 miles from downtown Kingston. For more information about any of the airports or about local area transportation, follow the links above. Best Time To Visit: The weather in the Caribbean doesn’t vary much throughout the year, with average daytime temperatures ranging from low-70s to mid-80s. Winter, from mid-December to late-March/mid-April, is by far the most popular time to visit the Caribbean because of travelers from the United States wanting to flee the cold winter months. If you’re looking to save money, the shoulder seasons from mid-April to May and late-November to mid-December are when airlines, hotels and resorts offer big discounts. The downside of traveling to the Caribbean during this time is that the social scenes won’t be as crowded as during the peak season (or it could be an upside, depending on how you feel about crowds).